Abidjan is the largest city, chief port, and de facto capital of Côte d'Ivoire (Ivory Coast). (Yamoussoukro is the official capital.) It is also the most populated city in French-speaking Western Africa. It lies along the Ébrié Lagoon, which is separated from the Gulf of Guinea and the Atlantic Ocean by the Vridi Plage sandbar. Abidjan is considered the cultural crossroads of West Africa, while its long economic boom brought such prosperity and growth that it earned the knickname "Paris of West Africa". The city flourished along with the country under the ideologically moderate leadership of Félix Houphouët-Boigny, however the political instability that followed his death and the nation's civil war of the early twenty-first century have taken their toll on the city. The name name "Abidjan," according to legend, came from a misunderstanding between an old man, with an armful of branches, and a lost European explorer, who asked him the name of the nearest village. Fleeing in terror, the old man shouted: "tchan me bidjan," which in the Ebrié language means "I've just been cutting branches!" The white man took this to be the name "Abidjan." The business district, the Plateau, is the center of the city. 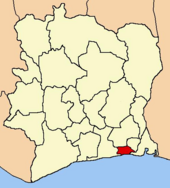 It lies with Cocody, an upscale residential area located east of the modern business district, Deux Plateaux (the richest neighborhood with mansions, typically inhabited by diplomats and the wealthy) and the slum area of Adjamé on the north shore of the lagoon, while Treichville and Marcory (also poor areas) lie to the south, Abobo-Doume and Yopougon to the west and Boulay Island in the middle of the lagoon. Further south lies Port Bouët, home to the airport and main seaport. The city is designed along colonial guidelines, on the basis of rather Utopian town-planning. The colonists inhabit The Plateau ("m'brato" in the Tchaman language) while the colonized people live in the north. The two zones were separated by the Gallieni Military Barracks, where the current law courts are located. Abidjan was a village in 1898, became a town in 1903, and was a rail terminus from 1904, although it depended on the wharf at Port-Bouët on the sandbar's ocean shore. The Petit-Bassam Wharf, the current Port Bouët, south of the metropolitan area, grew rapidly in competition with the Grand-Bassam Wharf. 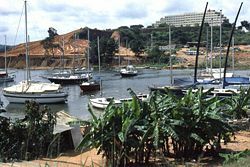 In 1904, when Bingerville had not yet been completed, Abidjan became the economic center of the Côte d'Ivoire colonies, a primary relay point for distribution of European goods further inland, notably by an increasingly important Lebanese community. In 1931, the Plateau and Treichville (which became Commikro, "the city of clerks") were roughly connected by a floating bridge at the place du pont Houphouët Boigny. In this year, the first of the street addresses of Abidjan were set up. 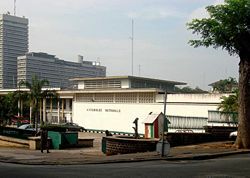 In 1933, Abidjan succeeded Bingerville as the capital of the French colony. In years 1940 between 1950, like Cairo, Tangier and Istanbul, Abidjan became a part of popular imagination as a nest for spies and criminals. The Vridi Canal, completed in 1951, opened the lagoon to the sea, and the city soon became the shipping and financial center of French-speaking West Africa. 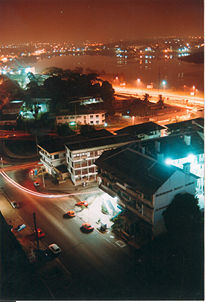 After independence, in 1960, Abidjan retained its status as capital. The southern areas of Treichville, towards the international airport and the beaches, became the district for Europeans and middle class Abidjanians. The Cocody district (famous for the movie Le Gentleman de Cocody by Jean Marais) became an upper-class political district which contained the presidential residence, the French Embassy, the Ivory Hotel, and since 2006, the largest United States Embassy in Africa. Abidjan entered a long economic boom which lasted until the 1980s, earning it the name "Paris of Africa." With elegant casinos and world-class hotels, the city billed itself as the safest and most desirable tourist destination in West Africa. But in 1983, Yamoussoukro, a town located about 170 miles (274km) to the northwest, became the new capital of Côte d'Ivoire under president Felix Houphouët-Boigny, who wanted to transform his native village into the Brasilia of the African Savannah. Abidjan entered into a decline in the 1990s, characterized by run-down infrastructure and a growth of pollution, blamed on negligent civil servants, political infighting following Houphouët-Boigny’s death, and high levels of corruption. Since 1999, the city has suffered from the chaos and economic dislocation caused by civil war in the north Ivory Coast, political tumult, and flight of capital. Large working class zones of migrants were the location of the anti-French riots of November 2004. On September 6, 2006, hundreds of people protested in the streets following the deaths of two children who had inhaled fumes from toxic waste. 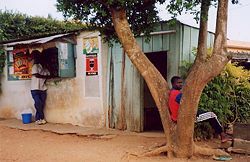 Côte d'Ivoire fell into civil war in September 2002. Although most of the fighting ended by late 2004, the country remained split in two, with a rebel-held north and a government-held south. Both French troops and UN forces were brought in, in an attempt to secure peace. A peace agreement to end the conflict was signed in March 2007, however there continues to be instability. The crime rate has increased as a result of poor economic conditions, an influx of weapons and refugees from neighboring Liberia, and urban migration. Burglaries commonly occur at residences, restaurants, and small businesses. Petty theft is prevalent throughout Abidjan and armed gangs are a growing problem. In August 2001, the government of Côte d'Ivoire disbanded the City of Abidjan, and merged its ten communes with the three sub-prefectures beyond the City of Abidjan to create the District of Abidjan whose limits match those of the département of Abidjan. The new District of Abidjan (818 square miles or 2119 square kilometers) is thus much larger than the former City of Abidjan (163 square miles). The reform was implemented in 2002, with local elections taking place that year. In 2011, the post of Mayor of Abidjan was replaced by that of District Governor, appointed by the head of state. Abidjan has a modern deepwater commercial seaport, forming a gateway to Western Africa, and the Common Stock Exchange of West Africa is located there. The city has branches of the World Bank, the International Monetary Fund, the Regional Values Exchange, the African Bank of Development, Crédit Lyonnais, Citibank, Chase, Barclays, among others. Manufacturing, which has ballooned since the 1960s, includes food processing, coffee, cocoa, lumber, automobile manufacturing, and the manufacture of textiles, chemicals, and soap. There is also a large oil refinery. Exports include coffee, cacao, timber, bananas, pineapples, and palm and fish products. The Plateau and the Ébrié Lagoon at night, as seen from the Pyramide. Tourism is of increasing importance. Tourist attractions include the immense Hôtel Ivoire, which features a bowling alley, cinema, casino, and the only ice rink in Western Africa, and the St. Paul's Cathedral, which is one of the continent's most elaborate churches. North of the city is Banco National Park, a magnificent tropical rainforest. The two halves of the city (northern Abidjan and southern Abidjan) are connected by the Houphouët-Boigny and de Gaulle bridges. These bridges are located between Treichville and the Plateau, their capacity is definitely insufficient, especially during peak hours. The SOTRA (Society of Transportation, Abidjan) and the SOTU (Society of Urban Transportation) ensure regular urban transportation by means of Bus, Taxi baggage and Ligne Express train. Road transport features the Gbaka, a type of mini bus, with a capacity of about 18 passengers, and the Woro-woro, which is a shared taxi which can carry five to six passengers. Trains on the line to Ouagadougou run from several stations in the city, the most important being in Treichville. Ferries link Treichville, Abobo-Doumé and the Plateau. The airport is located approximately ten miles (16 km) from downtown Abidjan. Abidjan's modern port opened in 1950, when the Vridi Canal was cut through a sandbar, linking the Ébrié Lagoon with the Gulf of Guinea and the Atlantic Ocean. The harbor traffic was 12 million tons in 1995, including 5.5 in petroleum products. Formerly West Africa's pre-eminent port, Abidjan is attempting to bring back traffic which veered to other ports during Côte d'Ivoire's political unrest. Abidjan has an international airport that can accommodate large transport aircraft, and is served by the most airline companies. Abidjan is approximately a one flight hour from most regional capitals. The Abidjan district contributes approximately half of the national production of electricity. Ivory Coast Telecom has a powerful fixed telephone network with 450,000 lines (2004), providing high speed Internet, and ADSL. Several access providers like Aviso de Cote d'Ivoire Télécom, Africa On Line, and Globe Access operate within the city. The population of Abidjan was 4,707,404 at the 2014 census. In 2006, the metropolitan area of Abidjan had 5,060,858 inhabitants. This population increase can be attributed to the displacement since September 2002. The war brought an influx of people into the city, seeking employment and safer lodgings. From within Ivory Coast, the migration pattern was dominated by Akan (South-east, 48 percent), then Mande (North-west, 24 percent) and Krou (South-west, 20 percent). From abroad, the migration was Burkinabes (30 percent), Malians (22 percent), Ghanaians (19 percent), Natives of Niger (11 percent), of the Guineans (nine percent). It should be noted that of the Non-African migration, Lebanese migration exceeded that of Europeans, with the French being most in number of these. All in all, Non-African migration represents hardly three percent of the total population of Abidjan. 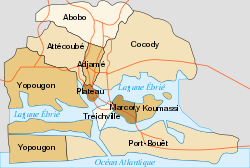 While French is the official language, 60 native dialects are spoken in the Ivory Coast, with Dioula the most widely spoken. Muslims made up 35-40 percent of the population in 2001, indigenous religions made up 25-40 percent, and Christians 20-30 percent. Abidjan has a museum of traditional Ivoirian art, a national library, and several agricultural and scientific research institutes. Abidjan is considered the cultural cross roads of Western Africa, and hosts various art and music festivals, including the International Festival of Black Music, the International Jazz Festival of Abidjan, the Festival of Urban Dances, the International Comics Festival, and the The RTI Music Awards, among others. There is also a museum of traditional Ivoirian art, a national library, and several agricultural and scientific research institutes. Football is the national sport of Ivory Coast, and Abidjan is the location of the nation’s two best clubs. An Olympic Complex of 80,000 to 100,000 seats was planned to offer a better national stage to the National Soccer Team, the Elephants, and was awaiting investors in 2008 to proceed. Other sports include basketball, athletics, rugby, handball, and volley ball. ↑ Côte d'Ivoire: General Information GeoHive. Retrieved March 16, 2018. Alquin, N. Abidjan Façon-Façon. Editions Echoppe, 1997. Dagou, Denis Koménan. L'influence des représentations et des croyances sur l'attitude parentale: Etudes de cas à Abidjan. Thèse pour le diplôme de doctorat de psychologie, Université Lumière-Lyon 2, institut de psychologie, 1999. All links retrieved March 27, 2018. This page was last modified on 23 January 2019, at 17:32.